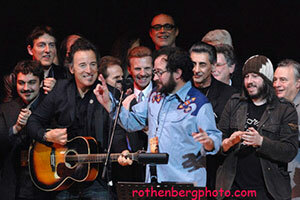 As a hard-rocking, frenetic version of "Atlantic City" performed by The Hold Steady wrapped up the "Tribute to the Music of Bruce Springsteen," a sold-out Carnegie Hall audience was pleasantly surprised as the man to whom 20 artists had previously paid tribute appeared on stage. 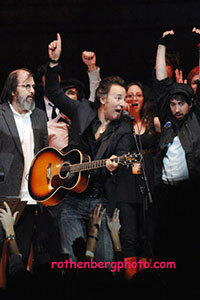 Benefiting the Music for Youth Initiative of the UJA-Federation of New York, the already-excellent performance was capped as Bruce walked up to the microphone, telling the crowd, "I'm still alive!" Springsteen's performance started with an acoustic guitar and harmonica version of "The Promised Land," pairing the familiar melody with the emotive vocal style used on versions on the Tom Joad and Devils & Dust tours. Bruce remained on stage to perform a surprise version of "Rosalita," first solo acoustic, with an improvised story in the middle ("it's been a long night, and I'm running out of lyric sheets! "), and then again with all of the evening's performers on stage, in all its full-band glory (house band Elysian Fields clearly knew their Bruce). Lead vocals the second time around were shared by Craig Finn of The Hold Steady, Badly Drawn Boy, and Jesse Malin. Earlier in the evening, Springsteen collaborators old and new were present to perform: Patti Smith sang "Because the Night," Jesse Malin was joined by Ronnie Spector on "Hungry Heart," and Marah got the crowd into the show early with an energetic performance of "The Rising." 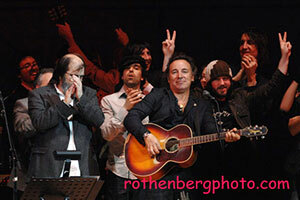 Other highlights (and there were many) included Joseph Arthur's version of "Born in the U.S.A."; Juliana Hatfield's solo electric reading of "Cover Me"; Badly Drawn Boy backed by Elysian Fields on a full-band "Thunder Road"; jazz pianist Uri Caine's "New York City Serenade" piano instrumental; Odetta performing what Bruce described as "the best version of '57 Channels' ever," and the Holmes Brothers' "My City of Ruins" with the Young People's Chorus of New York City, one of the musical groups receiving grants form the proceeds of the performance.